I’ve painted and folded plenty of origami on this site, but what about those little critters made from solid triangles on the stamping plates? They’re called tangrams and they are an ancient Chinese puzzle game. 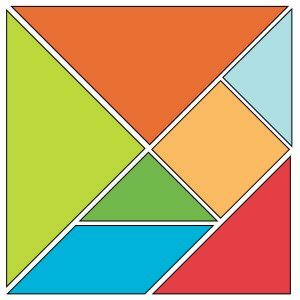 To make your own tangram, take a square of paper, felt, etc. and cut it in half diagonally. Then, cut both triangles in half again: one down the middle and the other across the base. Next, cut the long “base” strip in half to make two shorter pieces. Cut one side in half again to make a square and a triangle. Take the triangle and use it to pattern a second triangle from the other side so you have a triangle and a parallelogram. 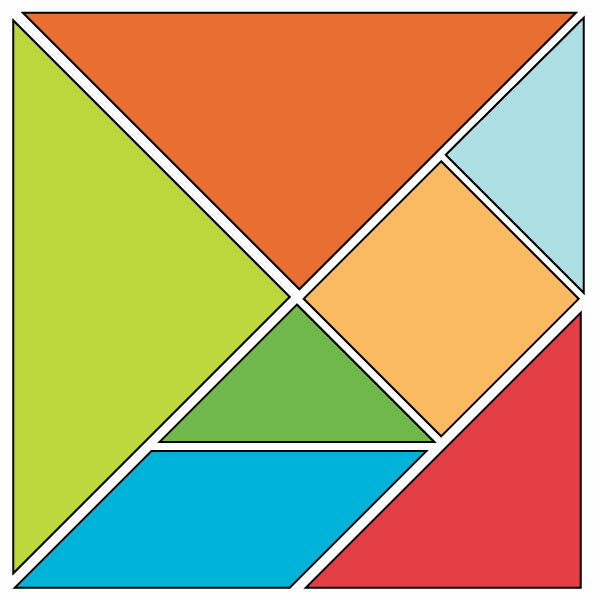 You should have five triangles (2 large, 1 medium, 2 small), a small square, and a parallelogram. Arrange the shapes to make pictures. The shapes must be lying flat on your surface. They must be touching and they cannot overlap. 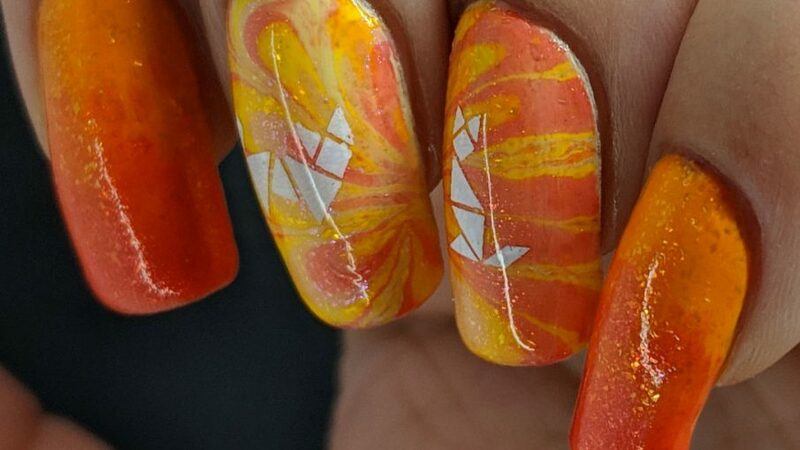 Now in the nail art world artistic license is given to make gaps between the pieces for visual interest, but the challenge is to either figure out an arrangement that looks like something or figure out how someone else created their arrangement. Thousands of different pictures have been discovered over the years. It’s pretty amazing. Check out this page to learn more! 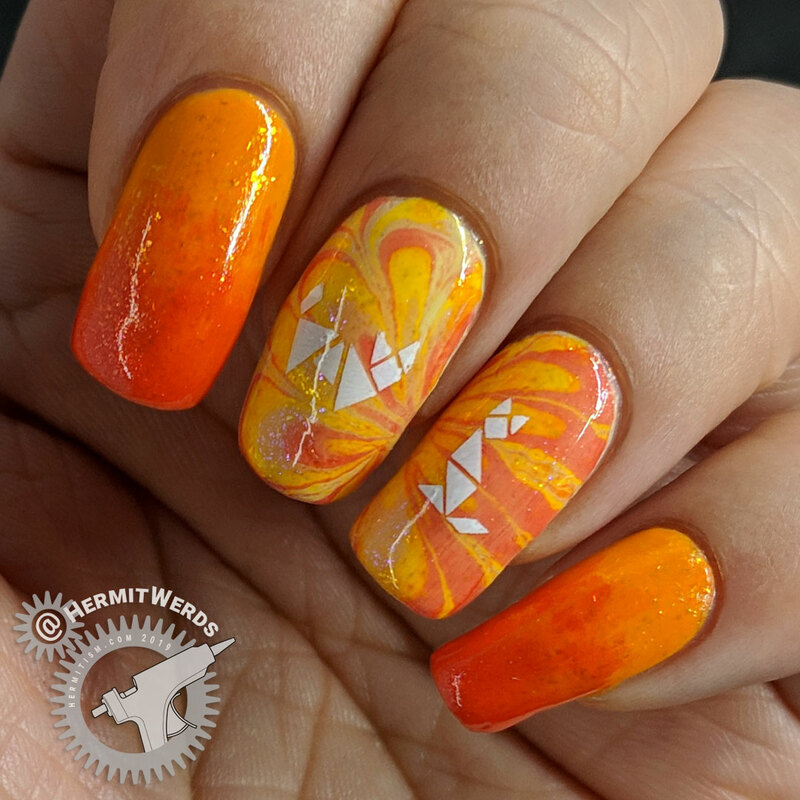 I used the two stamping plates I had with tangrams, but the ultimate tangram stamping plate is Moyou London’s Games 06, which I do not own (however, they are not always true to the traditional form). 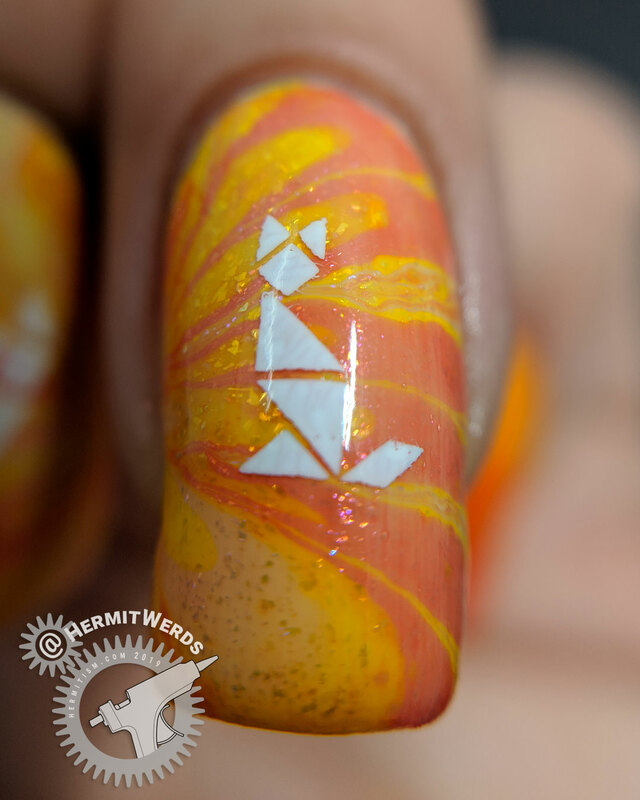 When I started getting into nail art as a hobby, I was voracious about collecting inexpensive mainstream nail polish. Back then, Sinful Colors were not only consistently available at Walgreen’s, but they were often on sale for $1 each. It was awesome. I bought polish collections just to have them and Sinful Colors is my most numerous polish brand to this day. That said, I would not buy the Citrus Twist collection now. They are extremely sheer jellies (only Horizon Shine really gets opaque on its own) and they dry in that slow way that ensures even with a great top coat you are likely to have dents. They also look terrible with a white undie, which I discovered the first time I used them pre-blog. The glass flecks just make it look odd so you have to use a colorful undie if you don’t want to embrace the visible nail line. 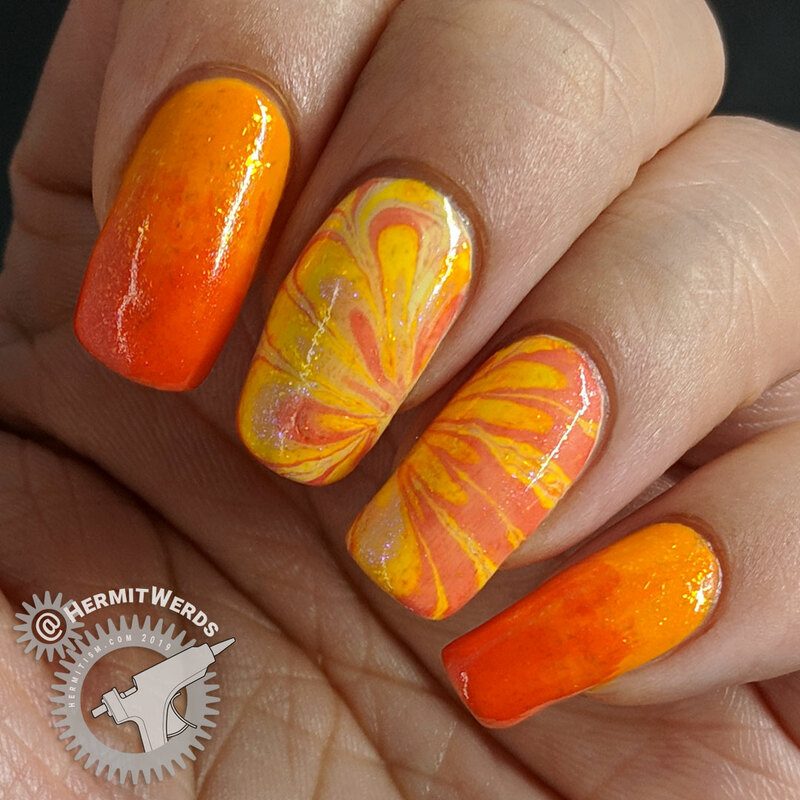 In this case I have a very pale yellow under the water marble and a light orange under my gradients. Both not fun formulas as well. Heh. Huh. So even though something is sheer and weird, you never know how you can turn it to your purposes until you try. 🙂 Next time I use one of these, I’m going to try going full jelly or at least just a baby boomer french tip.